Registration has been extended for LSM4263 – Field Studies in Biodiversity, Special Term IV! This 4MC-module will be conducted in Semester IV, AY2014/2015. Class begins 23 June 2015, Tuesday, and ends 30 July 2015, Thursday. A more detailed timetable will be made available later. – expected to cover part of the module cost (not amounting more than S$400). The field trip to Pulau Tioman is scheduled to be on 9 July 2015, Thursday, to 15 July 2015, Wednesday. Local accommodation will be at Paya Beach Resort. Local students’ enrolment is limited to a maximum of 30 students. Non-EVB specialists are welcome to apply as well, though priority may be given to students with LSM2251 Ecology and the Environment. To register, please complete the form below. Registration ends on 8th Jun 2015 (Fri), 12:00 pm . 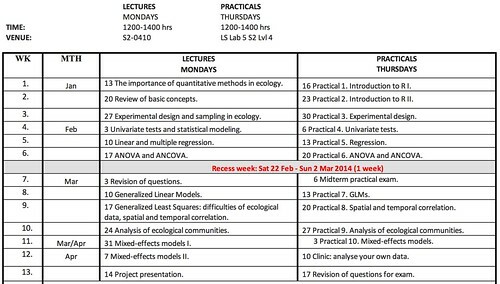 A new module is being offered this semester by our department’s ecological modeller, Roman Carrasco Torrecilla, entitled LSM3257 Quantitative Methods for Ecological Research. “The module is eminently applied and focuses on how to organize and analyze ecological data. One of the main aims was to provide honours students with the skills to analyse their data for their theses. A clinic is included for them to analyse their own data. Course details here and IVLE page here. Registration is open for LSM4263 – Field Studies in Biodiversity from 19th March 2010 to 30th May 2010. This 4MC module will be conducted in Semester IV of AY2009-10 and includes a field course at Pulau Tioman, Malaysia. The detailed timetable will be announced later but note that it will run from 28 June 2010 onwards. There is a limit on the class-size for this module. Preference is given to students with Biodiversity (LSM1103) and Ecology (LSM2251/LSM3251). possess a CAP of 3.5 or above.